Su YouTube e Inconstant Sol è iniziata, con il consenso dell'autore, la diffusione delle opere di Paul Dunmall pubblicate in proprio a partire dagli anni Novanta con etichetta Duns Limited Editions e distribuite inizialmente in cd-r in poche decine di copie. Registrazioni di gran pregio che documentano l'evoluzione e l'incessante ispirazione del sassofonista e che lo ritraggono in contesti diversi, dall'ottetto al quintetto, dal trio al solo, alle prese con sassofoni - tra cui anche il saxello che fu di Elton Dean - flauti e cornamuse di vario tipo. Di questa cospicua autoproduzione Steve Lake scrisse un gran bene, quando il catalogo constava di una ventina di titoli (giunti poi oltre quota settanta): "Once upon a time, it's said, record companies were able to keep pace with the inspirations of creative musicians. And whenever a Coltrane or a Miles or a Monk needed to document a new period, phase or idea, the microphones were there. An idyllic era in retrospect, it was a long time ago. Today, the relationship of the improviser to the music business is more distanced than ever. Sales plummet in the mainstream, the "death of jazz" is trumpeted once again in the trade press, the number of jazz musicians still courted by the majors dwindles by the week. Many fine musicians are reduced to paying their way onto one of the pseudo-independent labels that now define the "cockroach capitalisrn" of the alternative jazz marketplace. Small wonder that others throw up their hands and go it alone. 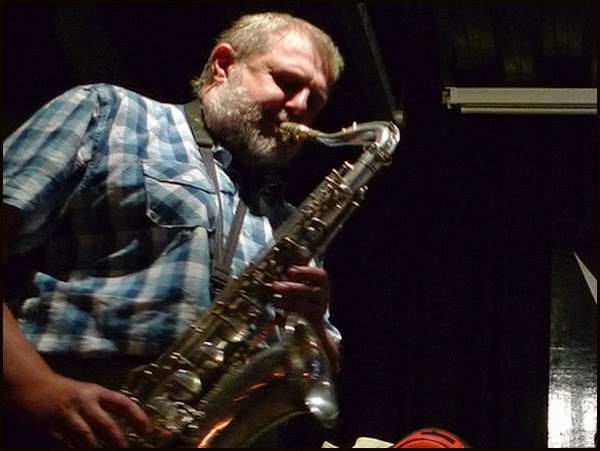 Click on the European Free Improvisation Pages on the Internet for a glimpse of just how many. Yet the feeling persists in some quarters that self-made CDs are not "real" records – they won't be reviewed in the dailies, say, if they don't carry the imprimatur of a commercial label or have "proper" distribution. If the same criteria were applied to literary production, history would have been deprived of such self-published classics as Joyce's Ulysses, Twain's Huckleberry Finn, Whitman's Leaves of Grass, Lawrence's Women In Love, and the complete works of William Blake. For instance. I don't know how many Joyces or Whitmans there are in the world of improvisation but for sheer prolificacy and range and intensity, few contemporary artists in any idiom can hold a candle to Paul Dunmall. The South London-born saxophonist's resumé as a player takes in work with everybody from Johnny Guitar Watson to the London Jazz Composers Orchestra, from Alice Coltrane to Robin Williamson. He's one of the most open-minded, open-eared improvisers anywhere and that openness is reflected in Duns Limited Edition, arguably the most exciting home-grown label to have shot up in our new century."